Earn $77.98 in Rewards credit (7798 points) What's This? 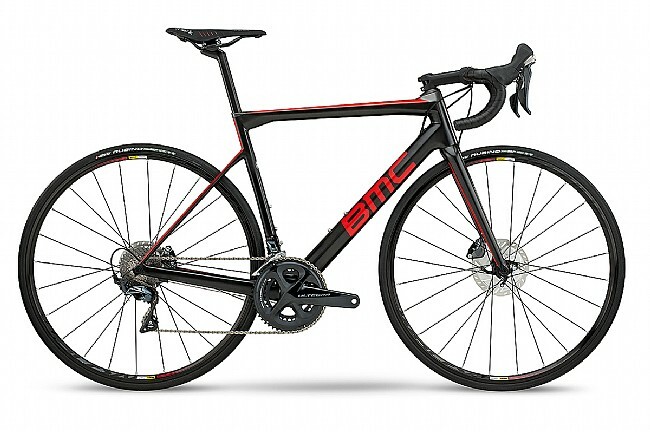 BMC’s 2018 Teammachine SLR02 Two Disc Road Bike features a lightweight carbon fiber frame and fork for a sleek look and responsive handling. Shimano Ultegra ensures rapid shifting while Mavic Aksium Disc wheels yield rapid acceleration and smooth rolling. Frame Material: Teammachine SLR02, ACE Technology, 02 Carbon. Fork: Teammachine SLR, 02 Carbon. Headset: Integrated, Tapered 1 1/8"-1 1/2". Brakeset: Shimano Ultegra, SM-RT800 Rotors (160/140). Saddle: Fizik Antares R7, manganese. Seatpost:Teammachine SLR02 "D" Carbon, 15mm offset. Hubs: Mavic Aksium Disc, 12mm thru axle, sealed cartridge bearings. Spokes: 24 front & rear, steel, straight pull. Manufacturer Warranty: 3-5 years for frame; 2 years for paint; 2 years for components.